Description About The Author:- Ms. Sarita was born in the family of academicians on June 30, 1978 in village Bijwara, District Baghpat, U.P. She started her academic career at Bundelkhand University where she is working as a Lecturer at the Institute of Education. She has obtained her Master Degree in Hindi from Meerut University and M.Ed. Degree from Bundelkhand University with Gold Medal. Ms. Monika Tomar was born in the family of academicians on September 17, 1978 at Bareilly, U.P. She has obtained her Master Degree in English Literature from the University of Delhi, and thereafter completed her Master of Education (M.Ed.) Degree with Gold Medal. She is currently working as a Lecturer at the Institute of Language Bundelkhand University, Jhansi.Contents:- Preface â¢ Educational Reforms in knowledge Age â¢ Curriculum Change as a Reform Strategy â¢ Community Role in School Reforms â¢ Priorities of Educational Innovation â¢ Conflict between Technology and Participation â¢ Curriculum Development in South Asia â¢ Challenges of Educational Technology â¢ Policies and Programmes in Curriculum Reforms â¢ Policies and Programmes in Curriculum Reforms â¢ Bibliography â¢ Index.About The Book:- This Book On Education Aims At Bringing Out The Benefits Of Revising The Curriculum Suitably To Suit The Changing Needs Of Society So That The Learner May Derive Maximum Benefit From The Education He Receives And In Turn Serve The Society In A Better Way. Innovation In Education Is The Need Of The Hour. Things Have Changed Radically Over The Past Few Decades In This Age Of Knowledge Explosion Curriculum Has Not. The Work Aims At Discussing The Subject Of Curriculum Reforms With Reference Not Only To India But Whole Of South Asia. In The Process, Countries Like Pakistan, Sri Lanka, Bhutan, Maldives And Nepal Are Discussed In This Context And Stress Has Been On Adoption Curricula In Unison With Other Parts Of The World. 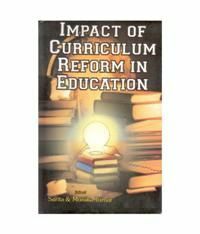 The Impact Of Curriculum Reform On Society And Its Significance Is Brought Out In This Volume. The Book Will Be Of Great Utility Not Only To The Teachers, Students And Academicians But To The Education Planners As Well., About The Author:- Ms. Sarita Was Born In The Family Of Academicians On June 30, 1978 In Village Bijwara, District Baghpat, U.P. She Started Her Academic Career At Bundelkhand University Where She Is Working As A Lecturer At The Institute Of Education. She Has Obtained Her Master Degree In Hindi From Meerut University And M.Ed. Degree From Bundelkhand University With Gold Medal. Ms. Monika Tomar Was Born In The Family Of Academicians On September 17, 1978 At Bareilly, U.P. She Has Obtained Her Master Degree In English Literature From The University Of Delhi, And Thereafter Completed Her Master Of Education (M.Ed.) Degree With Gold Medal. She Is Currently Working As A Lecturer At The Institute Of Language Bundelkhand University, Jhansi., Content:- Preface â¢ Educational Reforms In Knowledge Age â¢ Curriculum Change As A Reform Strategy â¢ Community Role In School Reforms â¢ Priorities Of Educational Innovation â¢ Conflict Between Technology And Participation â¢ Curriculum Development In South Asia â¢ Challenges Of Educational Technology â¢ Policies And Programmes In Curriculum Reforms â¢ Policies And Programmes In Curriculum Reforms â¢ Bibliography â¢ Index.